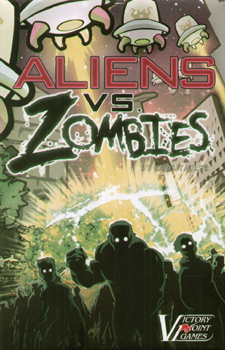 Aliens vs. Zombies is a small, low-complexity wargame for beginners, children and light-hearted fans of aliens and/or zombies. The aliens are invading a small town. A side effect of their weapons used to conquer humanity is the reamination of the newly dead, who are out for revenge. The alien player has fewer units but has the advantage of superior weaponry and armour. Zombies are plentiful and are divided into different types: rotting, tough and fast. Both sides can move or attack during their turn. Each side has one unique action: aliens can blast away with exploding dice and zombies can chomp their opponents to create new allies. Which side will you choose? Choose wisely and conquer, in Aliens vs Zombies.